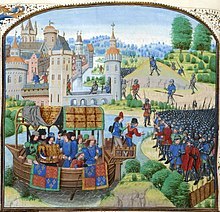 Richard II meets the rebels on 13 June 1381 in a miniature from a 1470's copy of Jean Froissart's Chronicles. There was a large epidemic of the Black Death, which lasted from 1347 to 1353. This reduced the number of workers and caused economic problems. In order to be able to finance Hundred Years' War, the English crown raised taxes, several times in short intervals. Other names for the rebellion are Wat Tyler's Rebellion, after Wat Tyler who was a local leader of the peasants in the rebellion. Yet another name is Great Rising. There were two types of peasants; serfs, and free peasants. The serfs, especially, had many difficulties. The serfs were farmers. These peasants had barely anything to live on, and did not get paid very well. The free peasants had less than all of the other social classes, except for the serfs. The free peasants had to pay rent to live "free", and also had to pay for most things (such as getting married, or collecting water). Even though they were "free" they still were controlled by the higher classes. The serfs got to live on the farms with the knights. The knights were there to protect them. The majority of peasants lived in houses which also housed the animals of the village. May 30th: The peasants of Essex chase Thomas Bampton out of Fobbing. June 1st: The revolt spreads through Essex, Hertfordshire, and Suffolk. June 7th: Maidstone and Rochester castles surrender to the revolt. June 10th: A new leader, Wat Tyler, appears. The rebels of Kent and Essex march on London to explain their grievances, but Wat Tyler has a different plan to assault London. King Richard II of England is completely surprised, and only has a few hundred troops in London. June 13th: The peasants kill many lawyers under the command of Wat Tyler. Most of London is not destroyed. King Richard agrees to meet the rebels at Mile End. June 14th: Richard meets with Tyler, and Tyler gives him the demands of the peasants. The king accepts all the demands. Meanwhile, a group of the peasants go to the Tower of London and behead some of their worst enemies. These include Simon Sudbury, Robert Hailes, and John Legge. June 15th: Wat Tyler wants to meet with the king again to make more demands. When they meet, Tyler is killed. King Richard orders his troops to destroy the rebels, and they kill over a thousand. This page was last changed on 25 March 2019, at 03:53.